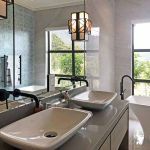 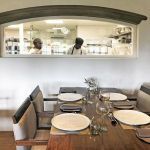 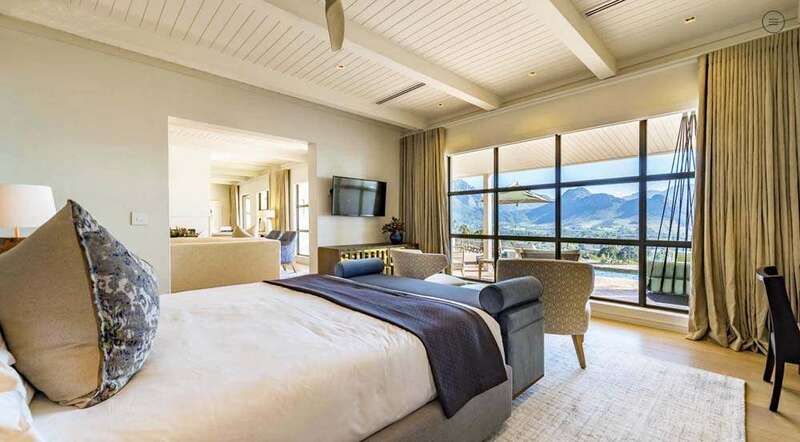 La Petite Ferme in South Africa’s Franschhoek winelands not only offers high quality homely accommodation but great cuisine and stunning views. 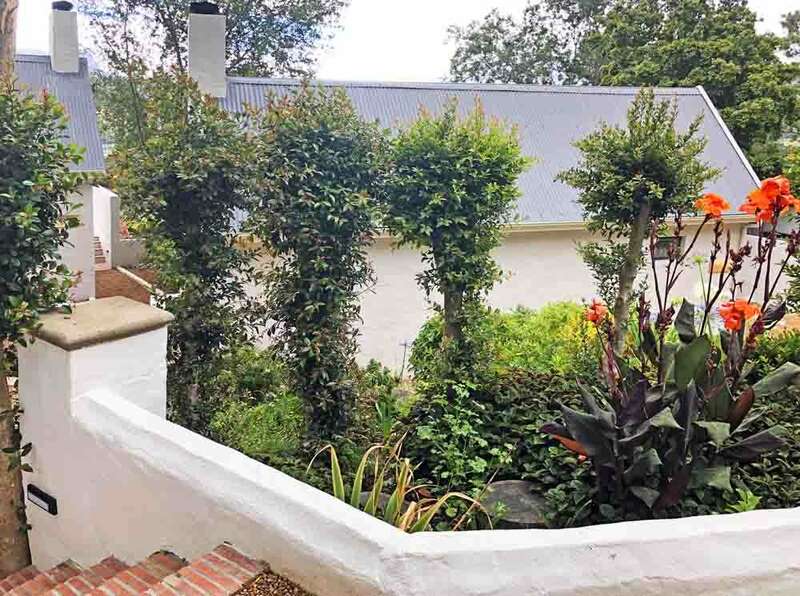 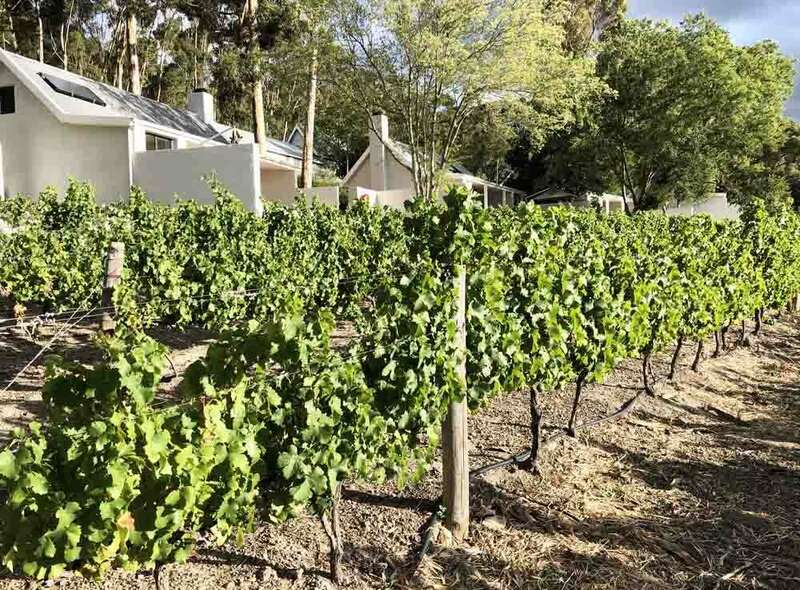 ‘The Little Farm’ is named, not as an affectation but as a reference to the 17th & 18th Century Huguenot exiles from France, who escaped persecution by Louis XIV, bringing their vines, crafts and skills with them, at the invitation of Dutch Protestant settlers in the Cape. 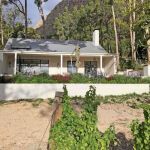 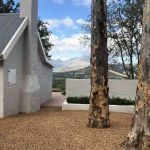 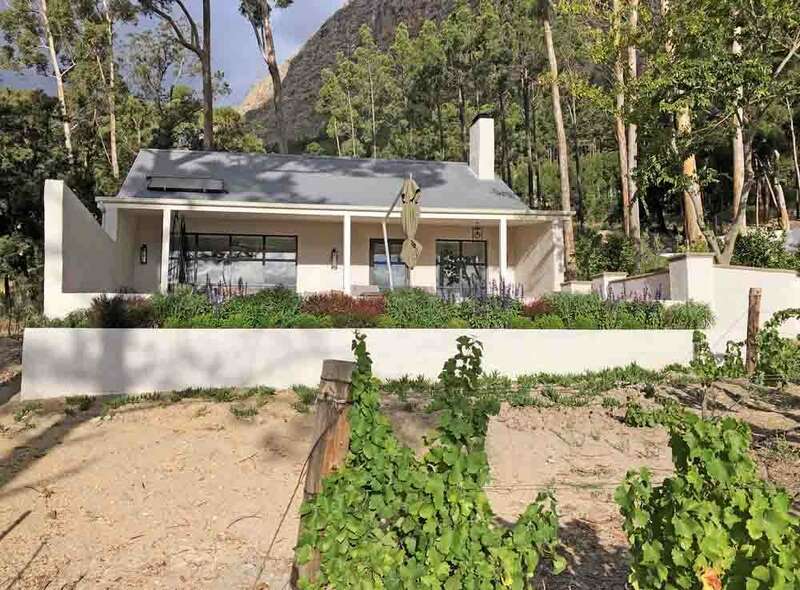 As the story goes, the farmer, struggling to make ends meet at La Petite Ferme decided to plant vines on his land – and in felling the pine trees to clear the land discovered that he could enjoy one of the most stunning views in Franschhoek. 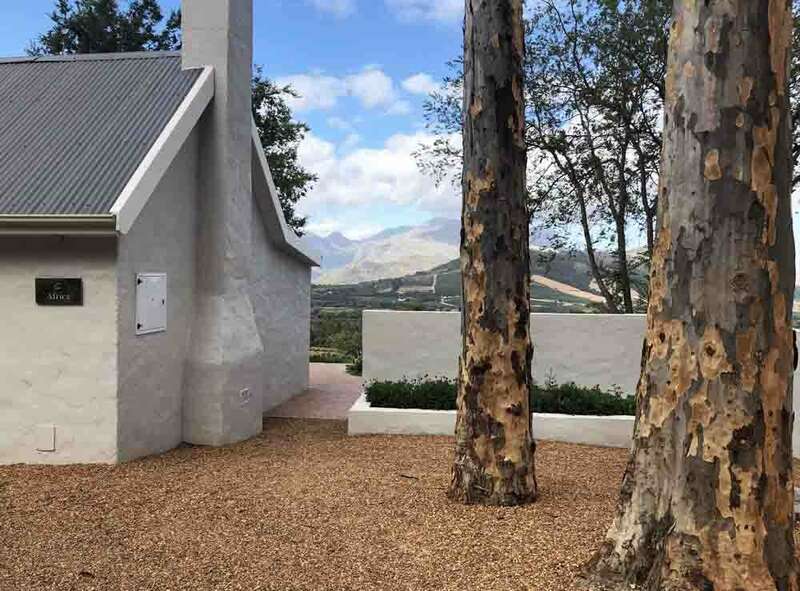 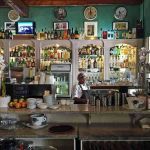 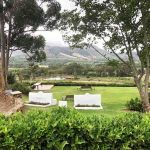 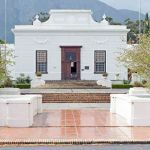 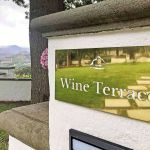 Franschhoek, or ‘French Corner’, is only an hour’s drive away from Cape Town and half an hour from Stellenbosch but brings huge reward for the journey. 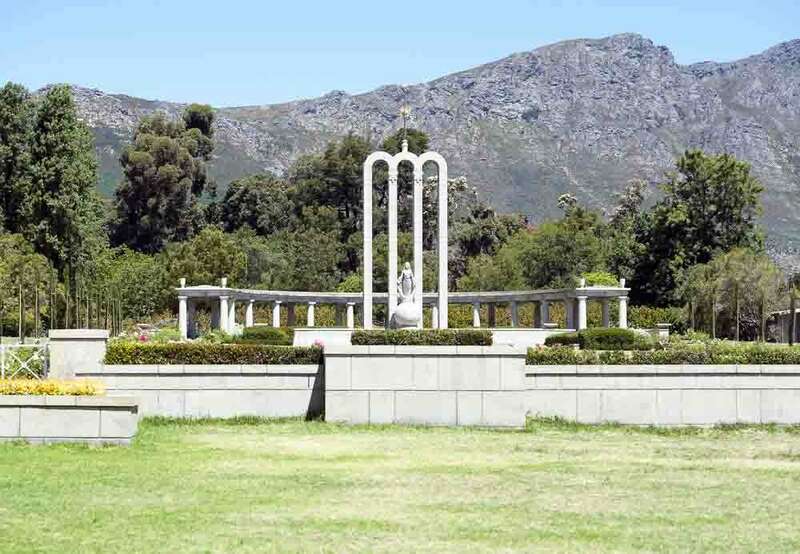 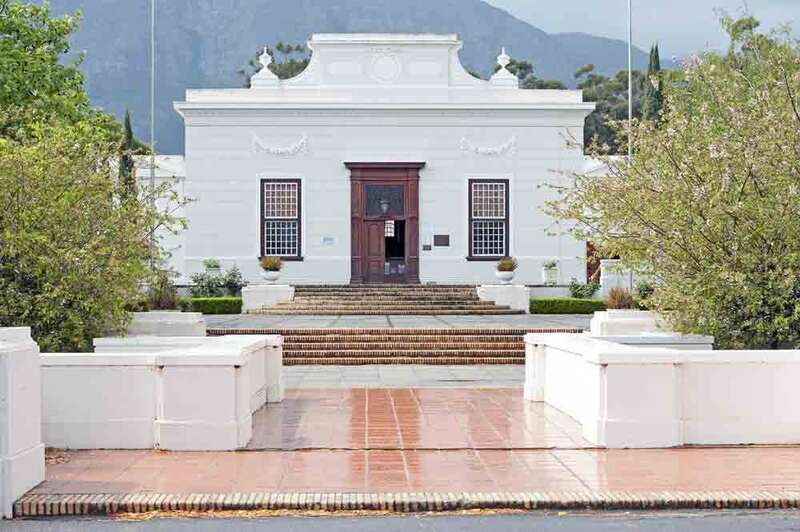 Whilst the small town itself is a pretty collection of art galleries, cafes, restaurants and craft shops, sprinkled with guest houses, a motor museum, the Huguenot museum and the monument to religious freedom, plus the ‘Wine Tram’ that trundles between picturesque estates – it’s the surroundings that are truly remarkable. 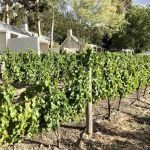 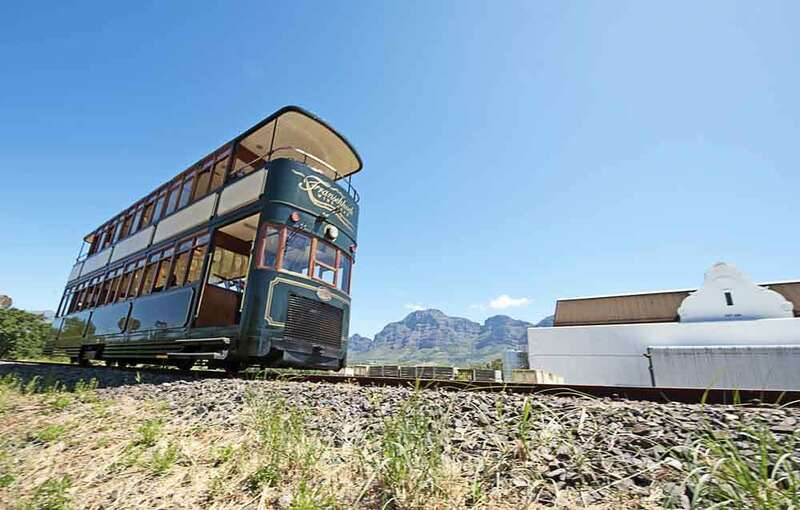 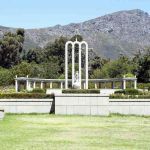 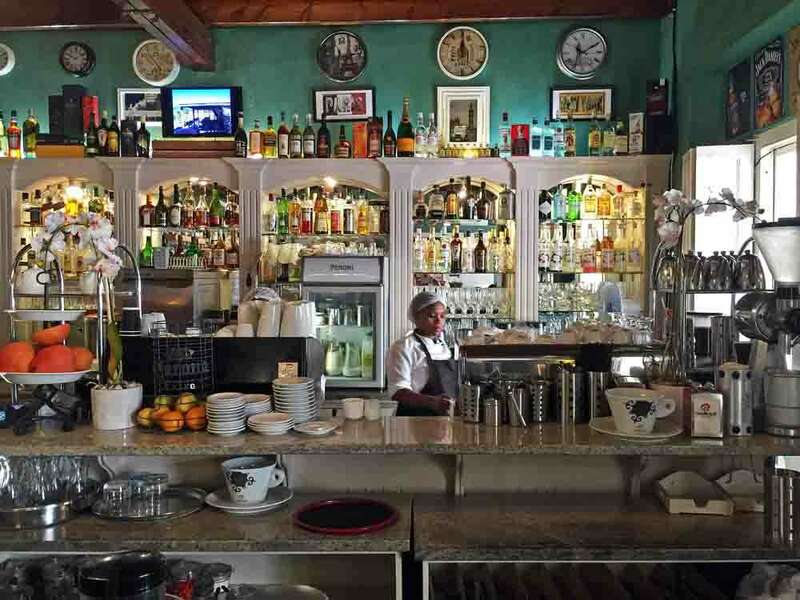 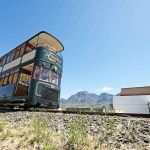 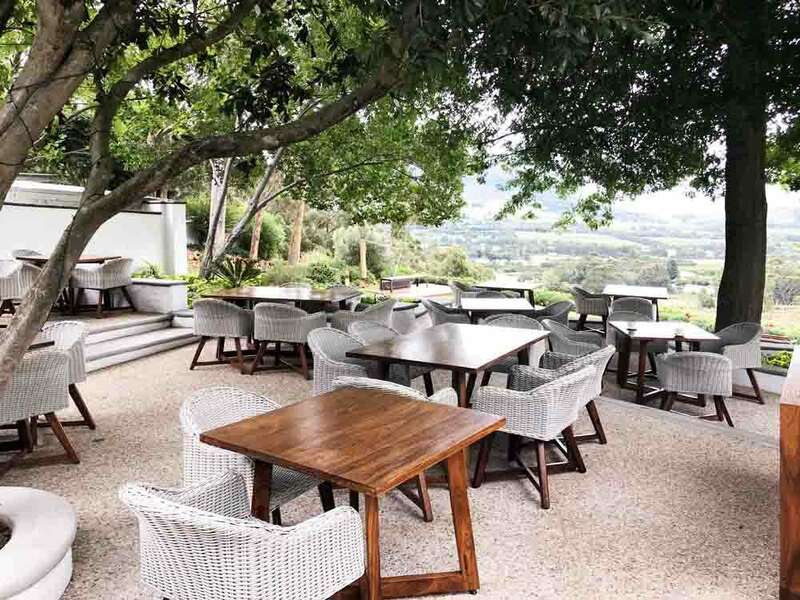 With a focus on fine wines and fine dining, the beautiful Franschhoek Valley and neighbouring Mont Rochelle National Park is a must for anyone who likes the beautiful things in life. 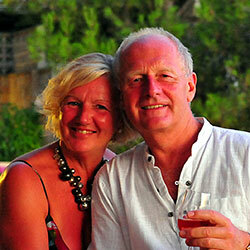 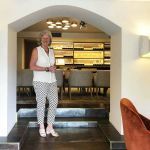 La Petite Ferme boutique hotel certainly embraces this approach. 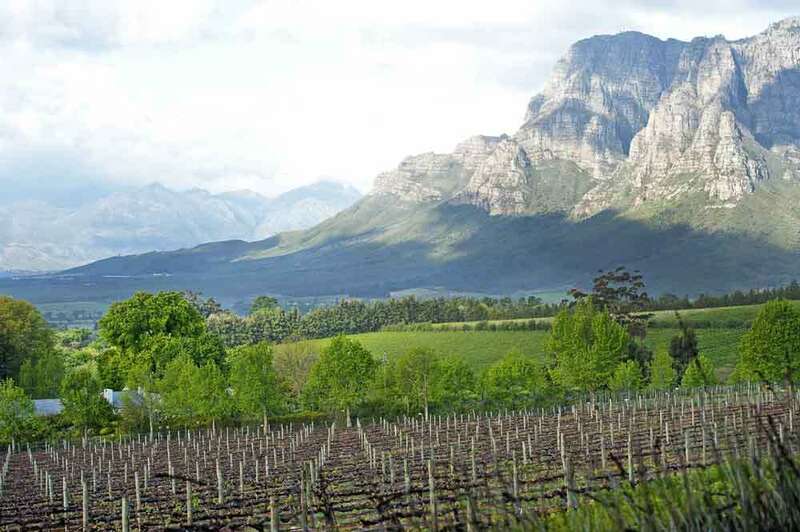 Nestled, as it is, on the valley side amidst the Drakenstein and Wemmershoek mountain ranges. 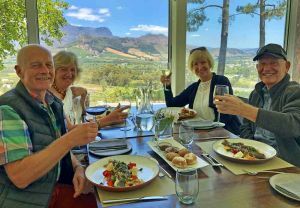 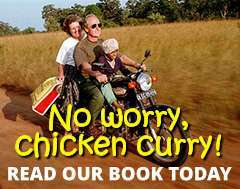 We find ourselves constantly looking outwards, rather than inwards, towards the magnificent scenery, whilst having lunch with South African friends – who must be wondering why they came to join us at all. 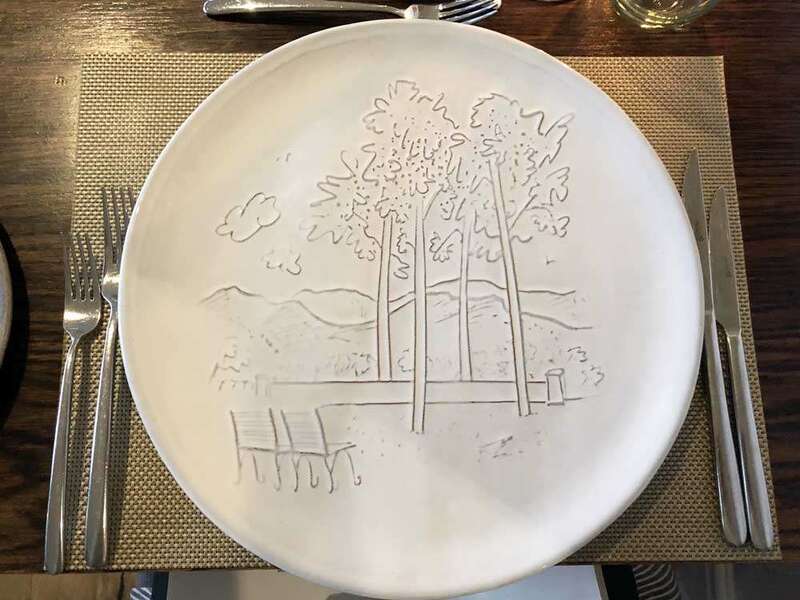 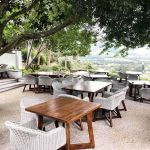 The main restaurant building of La Petite Ferme is elegant, albeit unremarkable with almost utilitarian architecture but the staff, service, cuisine and individual and separate suite accommodation is simply excellent. 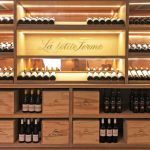 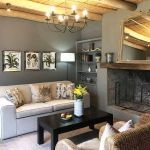 Happily, the lack of pretentiousness in the main building filters through into the overall ambiance of La Petite Ferme, in that it creates a homely, welcoming atmosphere that has us immediately relaxed and ready to enjoy all it has to offer. 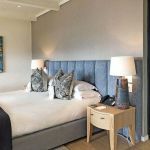 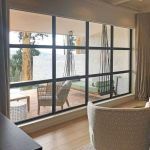 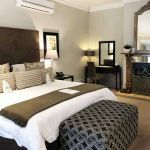 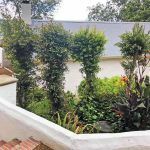 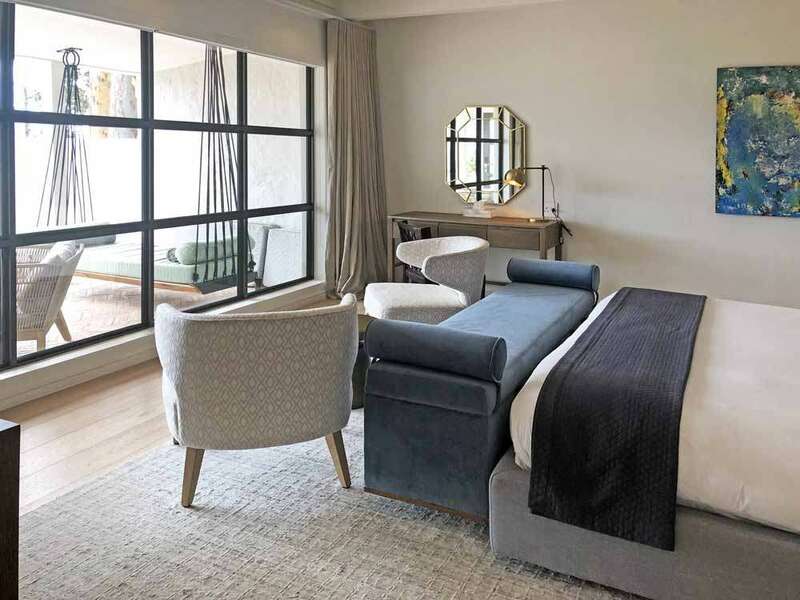 We’ve settled into one of the seven attractive and newly refurbished Vineyard Suites that each enjoy sweeping views of the valley through their full-width picture windows. 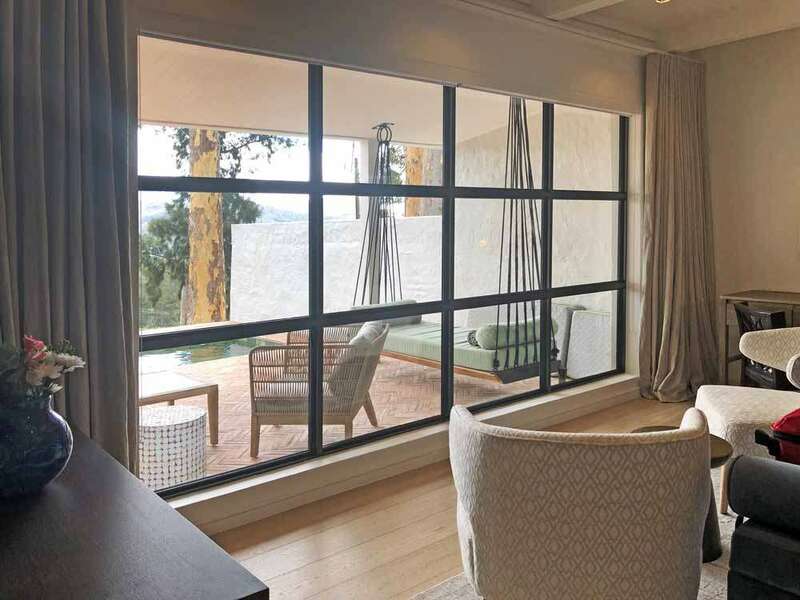 The views are so stunning its almost an afterthought that has us turning inward to our smart contemporary surroundings. 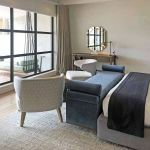 Our bedroom, lounge with its own open fireplace and smart walk-in shower and bathroom are all impeccably appointed and the decor is both minimalist and comfortable. 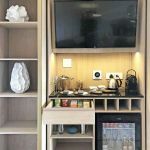 We note that the minibar and accessories cabinet has been compiled with thought – even a fresh lime and sharp knife being supplied for our G&T’s, should we so choose. 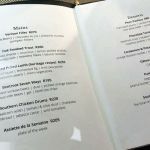 Its attention to the smaller details like this that really bring home that we’re guests here, not commodities. 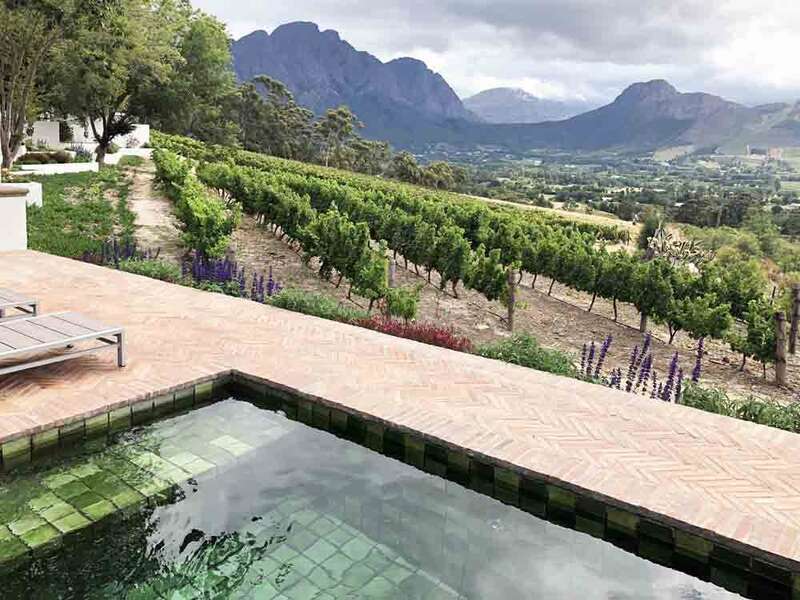 Our attention is forever drawn outwards again and we spend time just drinking in the views from our sun-loungers, across our own plunge pool to the vineyards beyond. 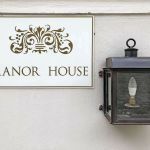 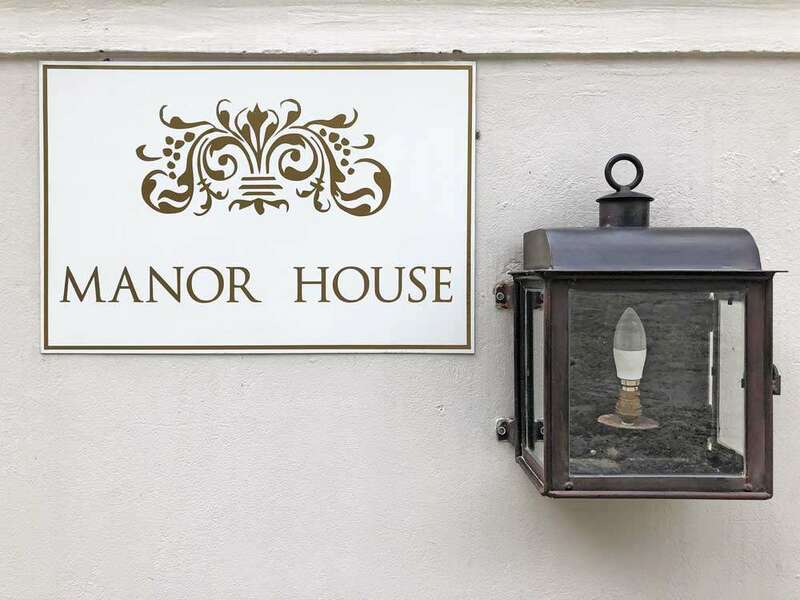 There is a separate Manor House, originally the owner’s house, with a further two suites of adjoined rooms, for a family or group to enjoy and this too faces the vineyard. 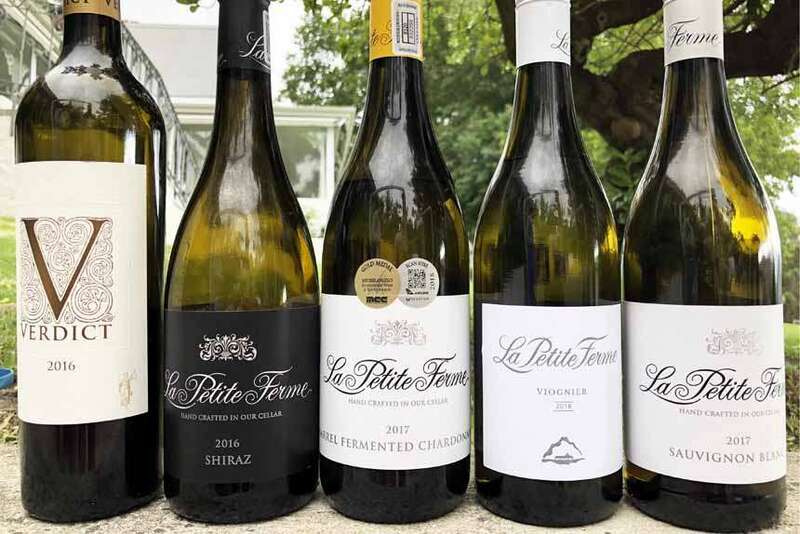 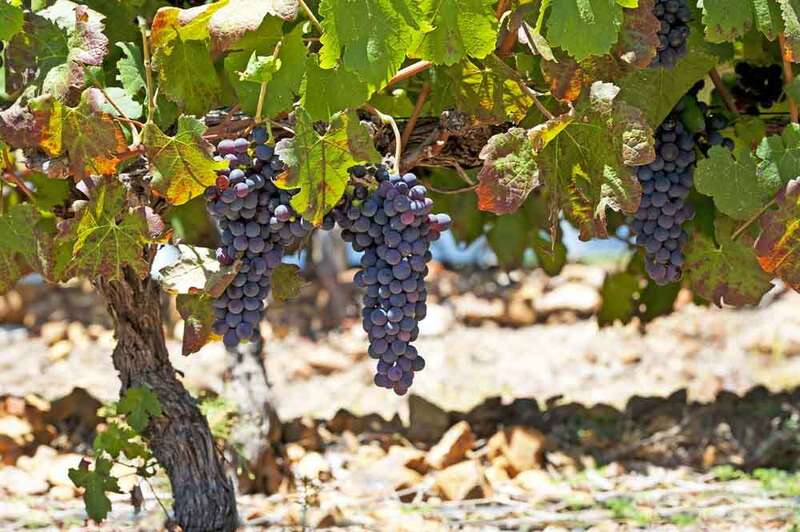 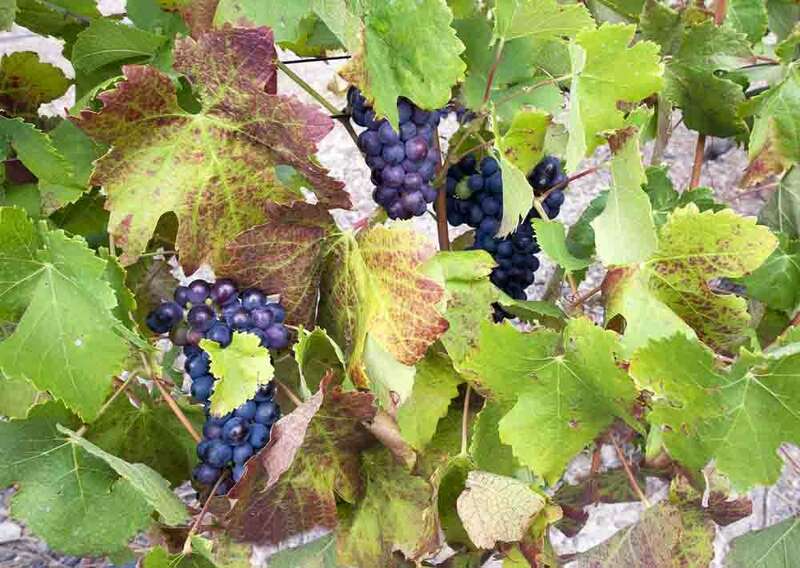 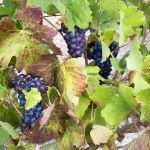 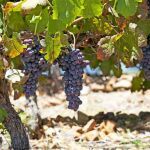 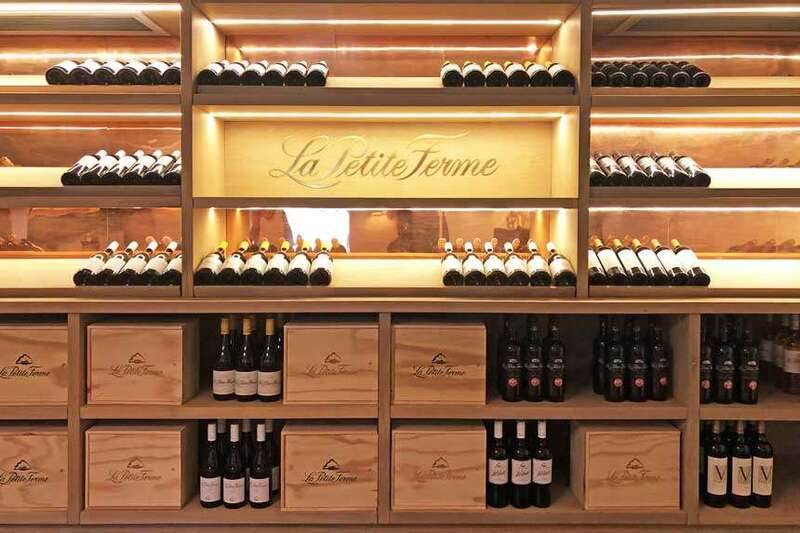 La Petite Ferme tends to 8000 of their own vines, producing as many bottles across several barrel fermented grape varieties, including Shiraz and Pinotage to Viognier and Sauvignon Blanc. 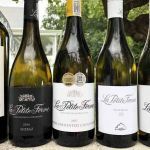 We enjoy a wine tasting of these boutique wines sitting in the sun outside their little cellar, which certainly puts us in the mood for dinner, where we experiment further! 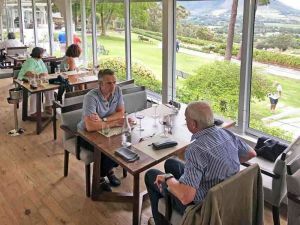 Our dining, for both dinner and lunches, is taken in the ’conservatory’ that fronts the property and capitalises, once again, on the wonderful views. 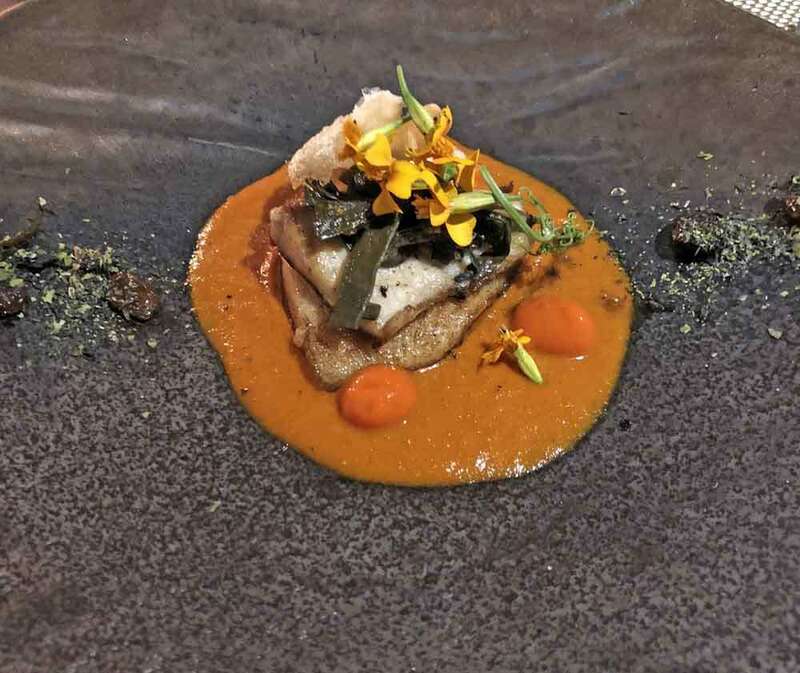 Our meals are colourful and interesting and whilst not perhaps the most exceptional dishes we’ve ever had, do admirably compliment the restaurant, as does the glass viewing area into a spotless kitchen. 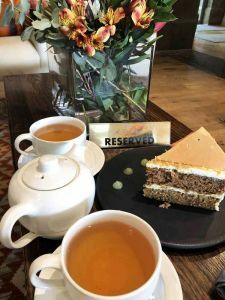 That said, there is great attention to detail and presentation, with the complimentary ‘high tea’ in the afternoon being just too much for us; so we settle for nibbling away at a huge slice of carrot cake; shared between the two of us. 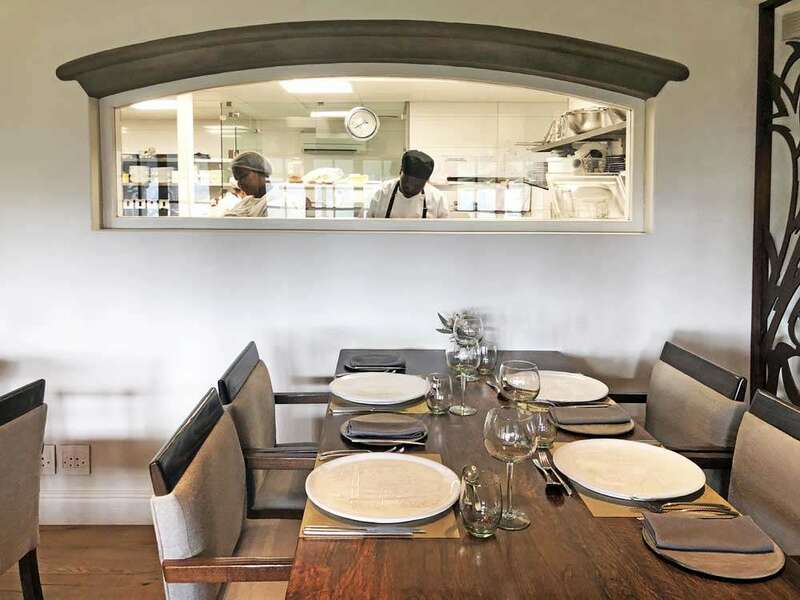 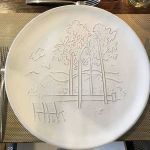 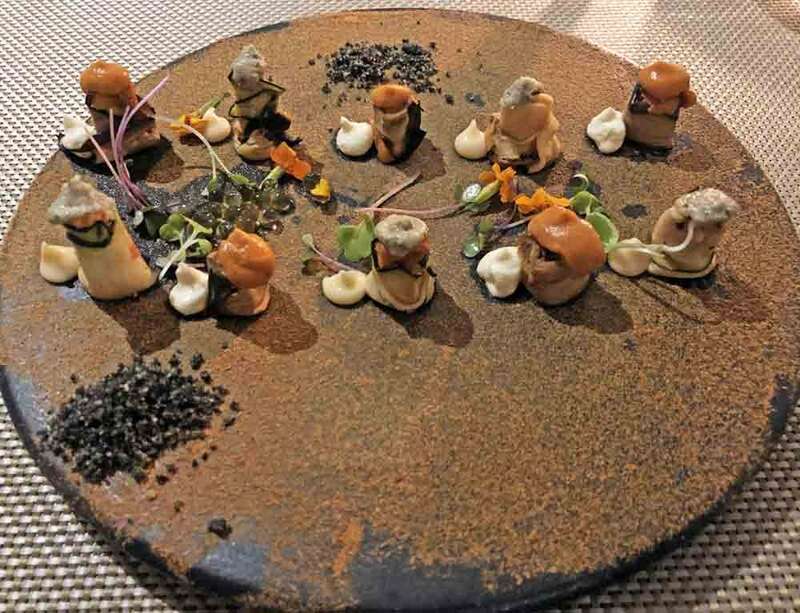 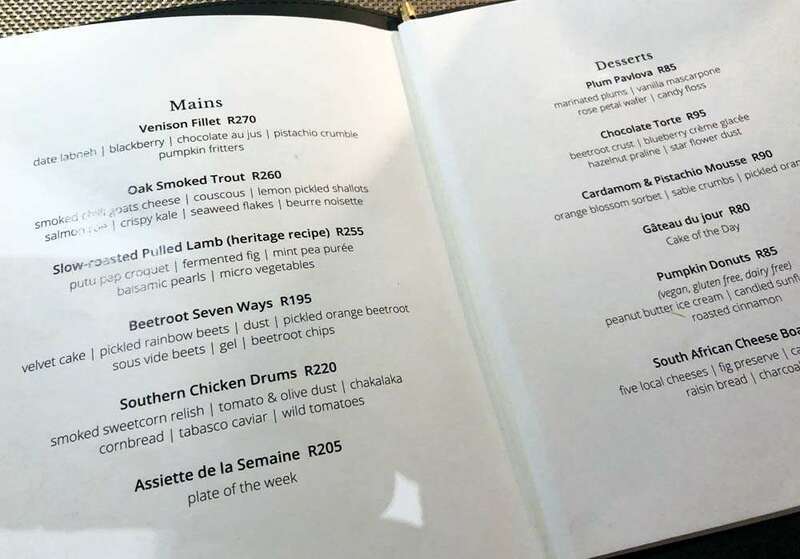 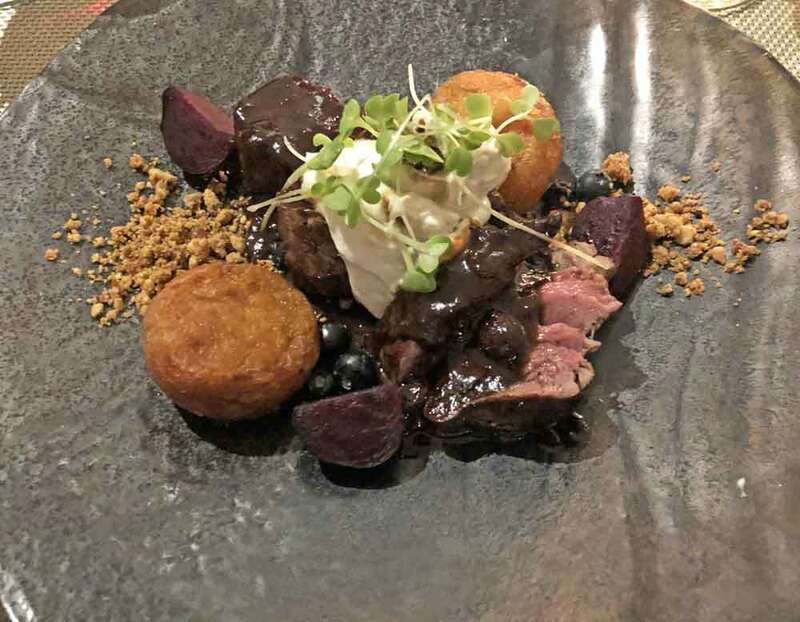 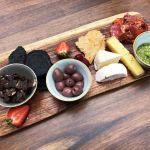 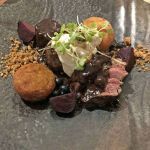 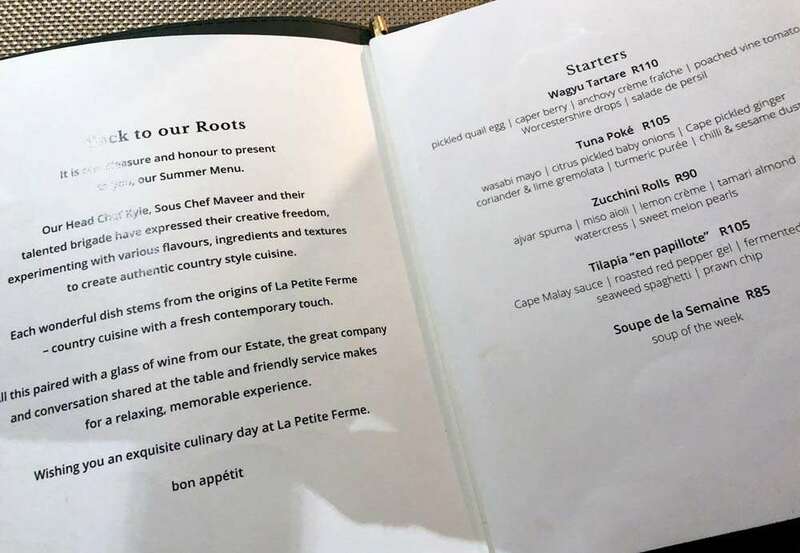 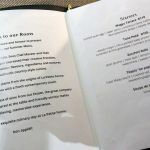 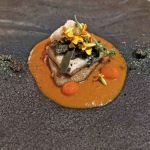 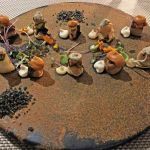 It would be churlish to fault La Petite Ferme on our limited experience of its cuisine – as we’re reporting on a moment in time – and given just how regularly booked up and busy the restaurant is, perhaps we are just unfortunate while here. 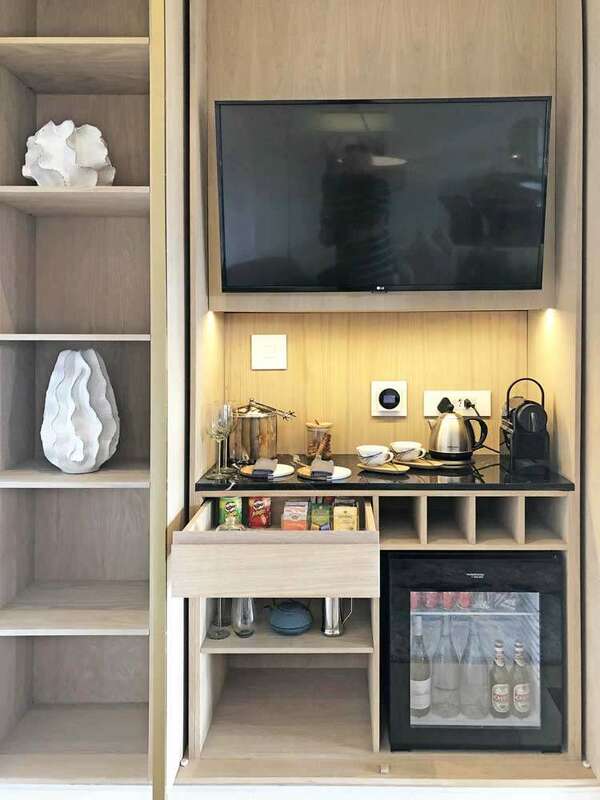 We indulge in the luxury of breakfast in our room on the day of departure and there’s little to compare with a relaxing breakfast, hot coffee and breath-taking views to set us up for the day. 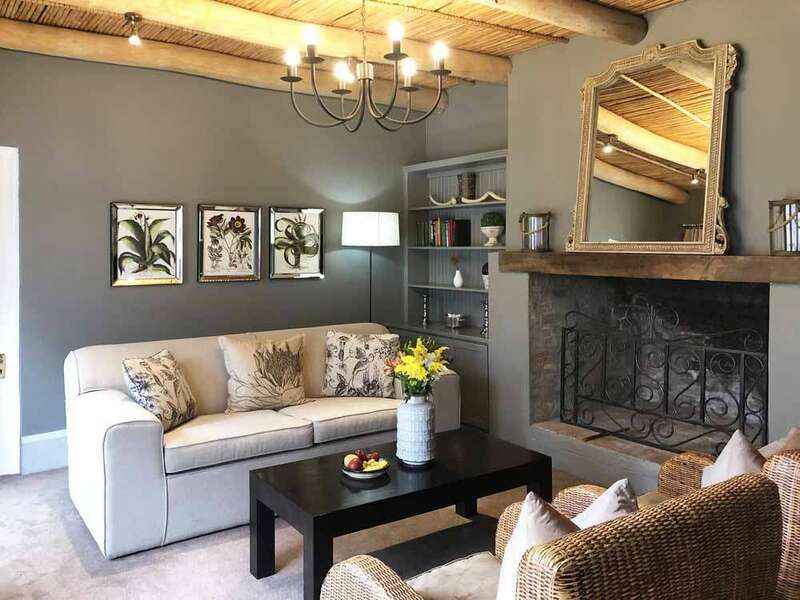 La Petite Ferme offers an all-round experience that means you almost don’t need to leave the place – it’s a perfect haven, complimented by the warmth and attention of its team of staff. 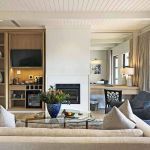 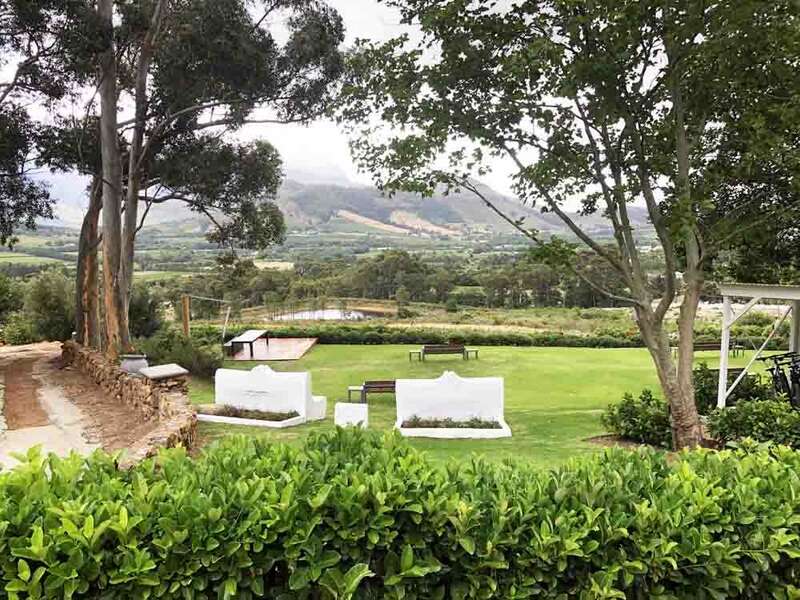 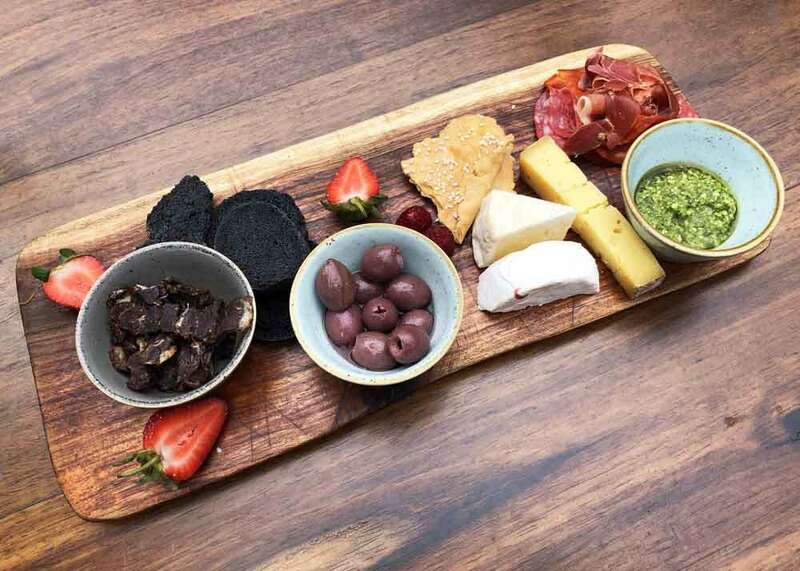 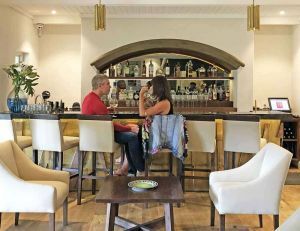 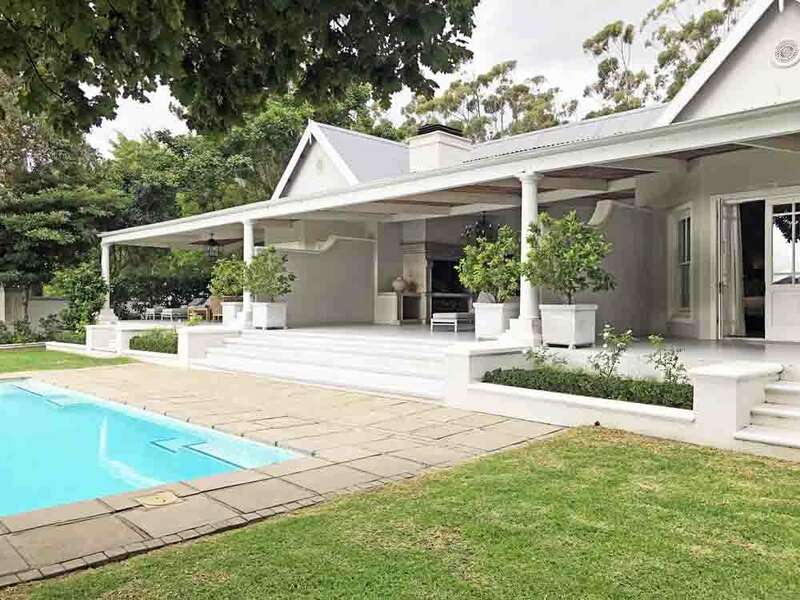 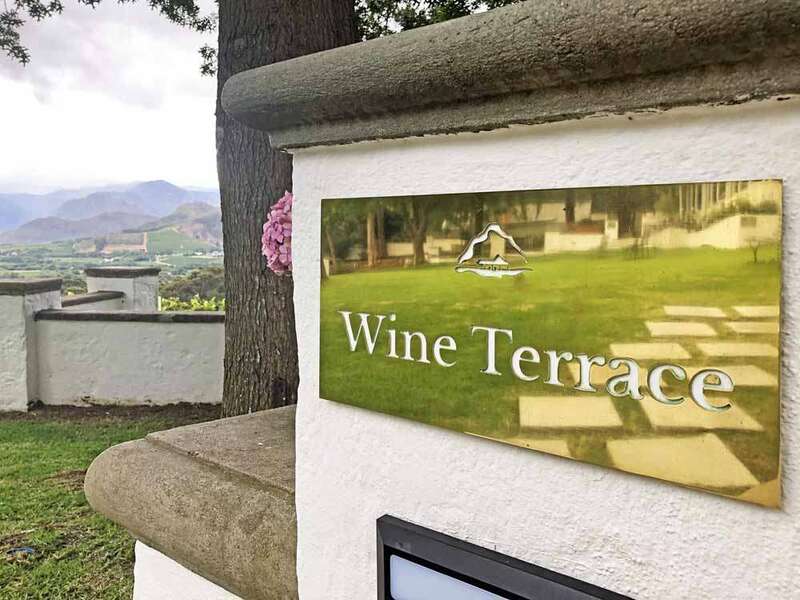 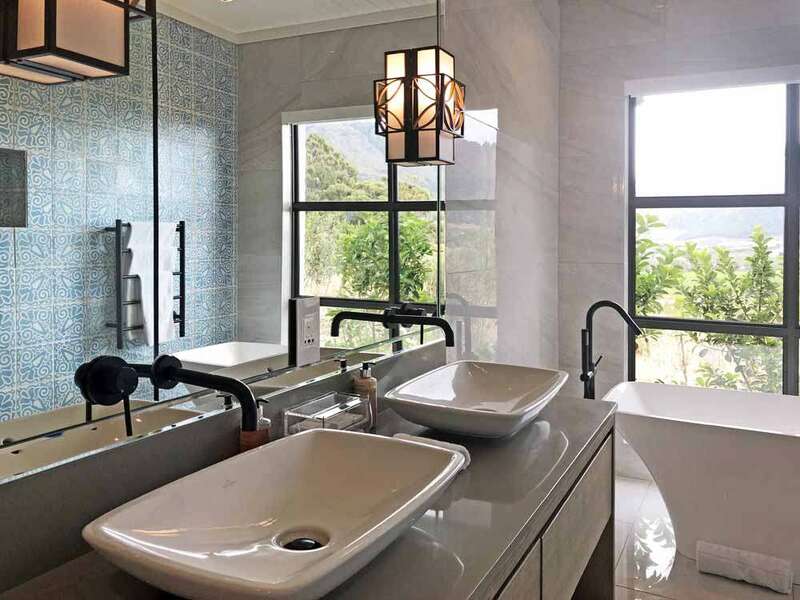 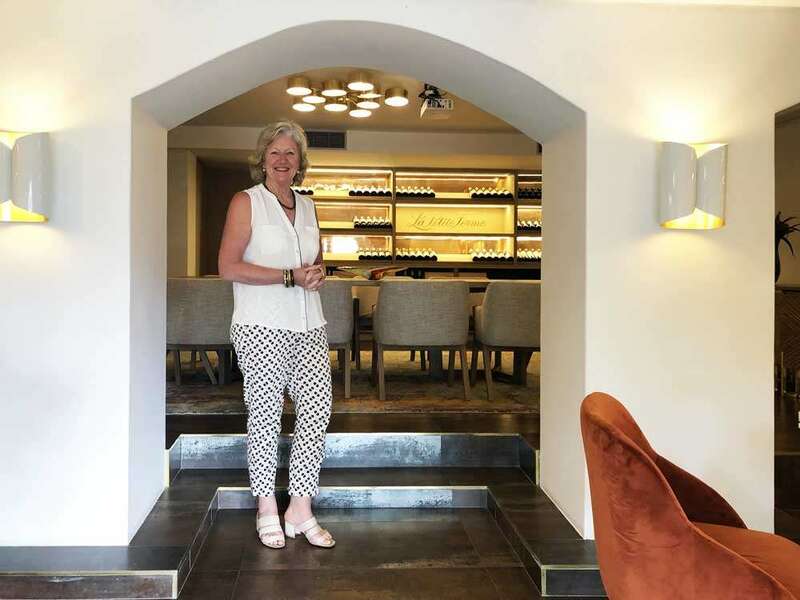 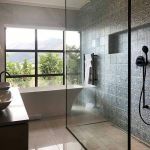 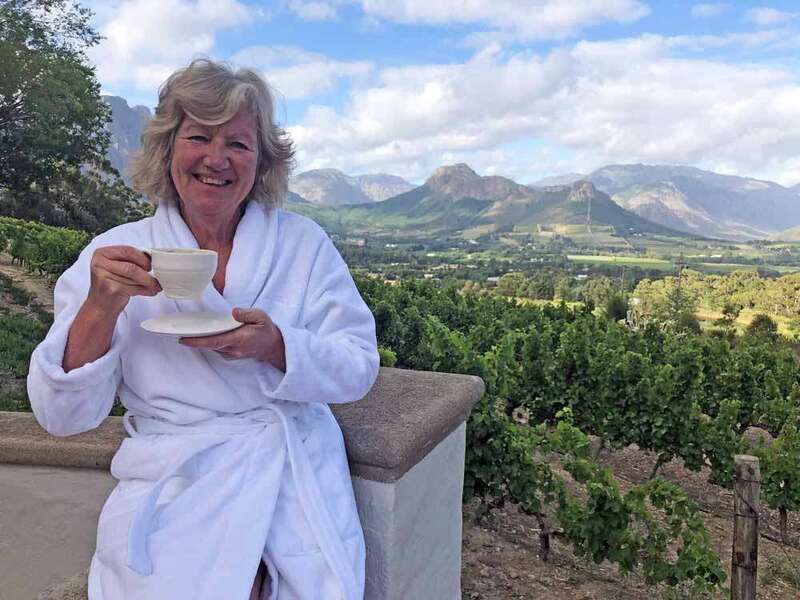 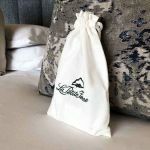 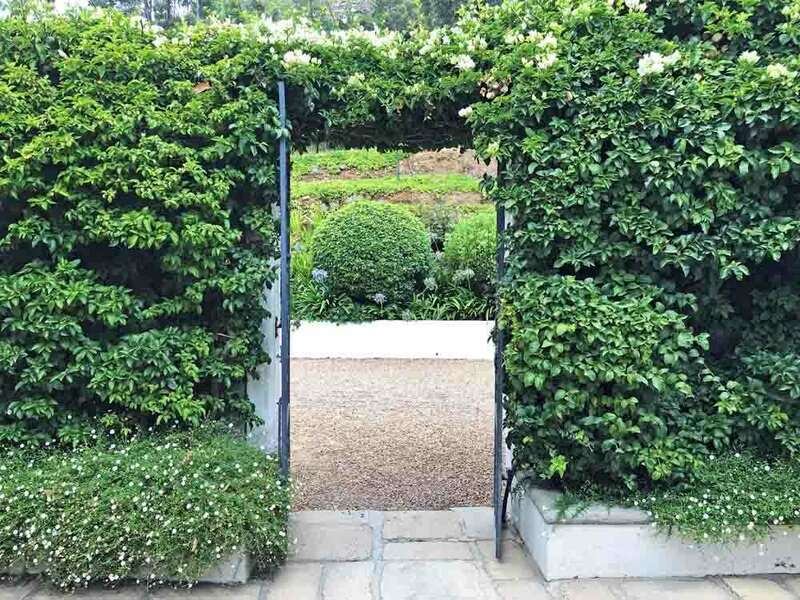 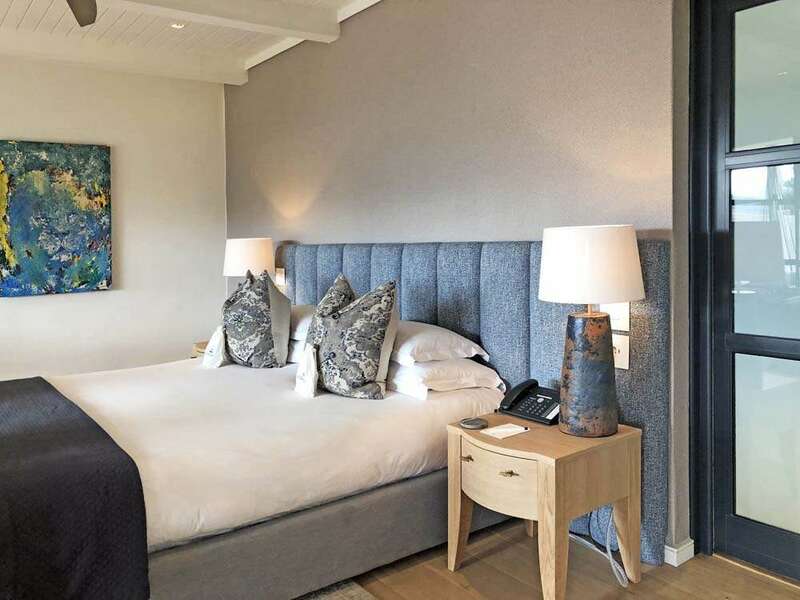 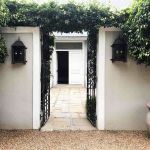 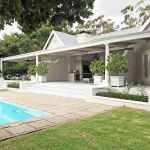 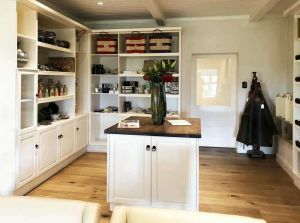 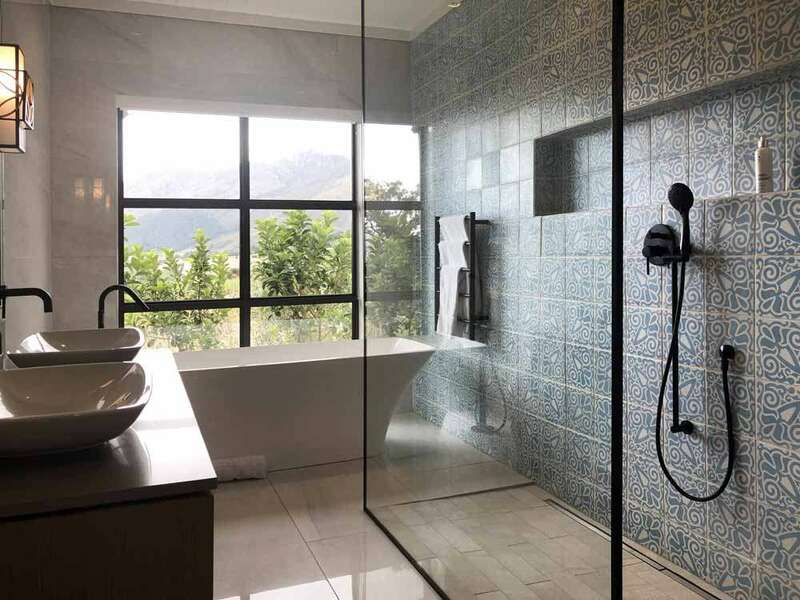 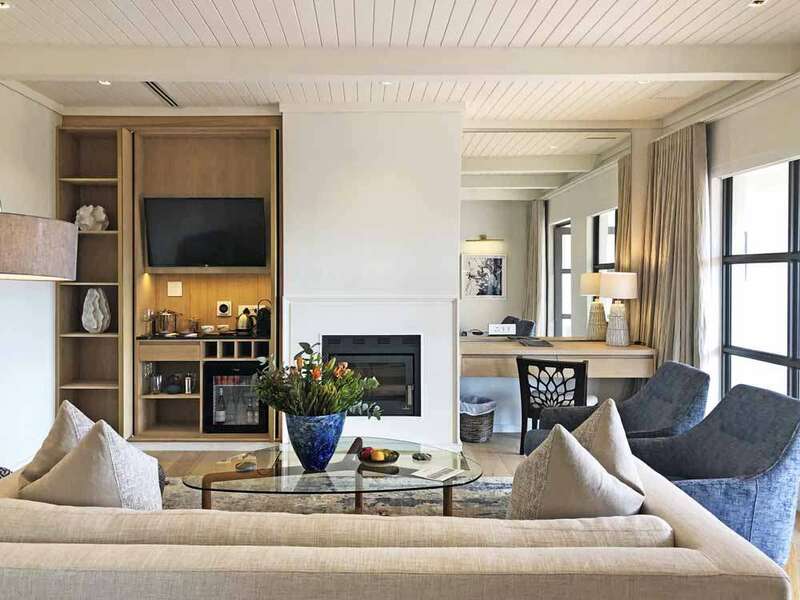 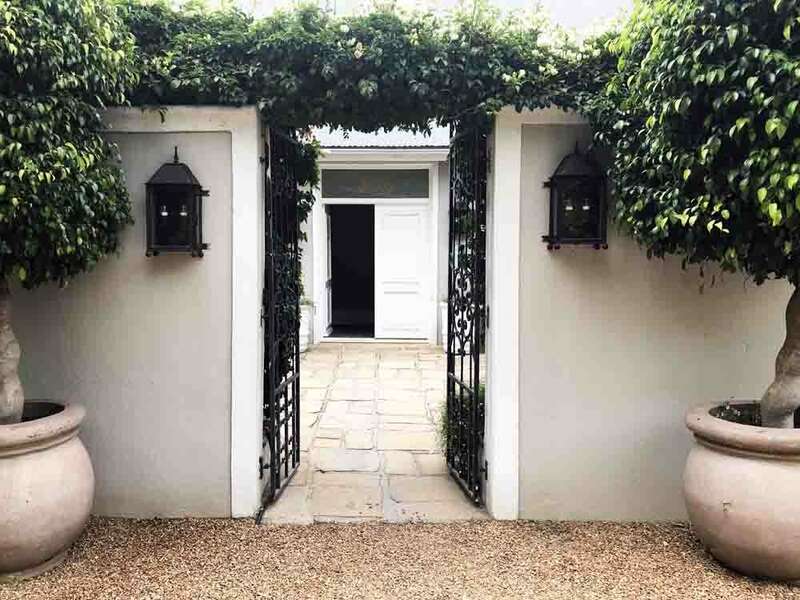 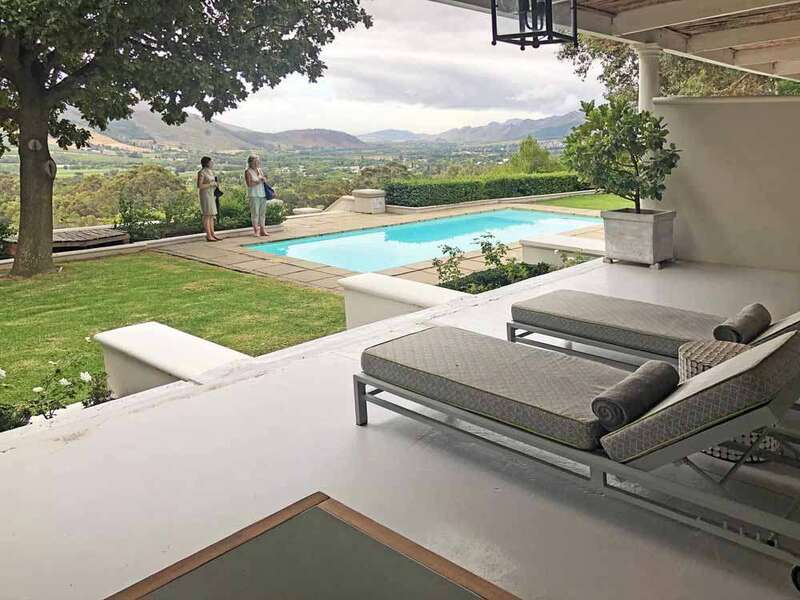 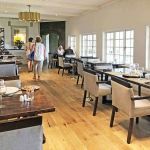 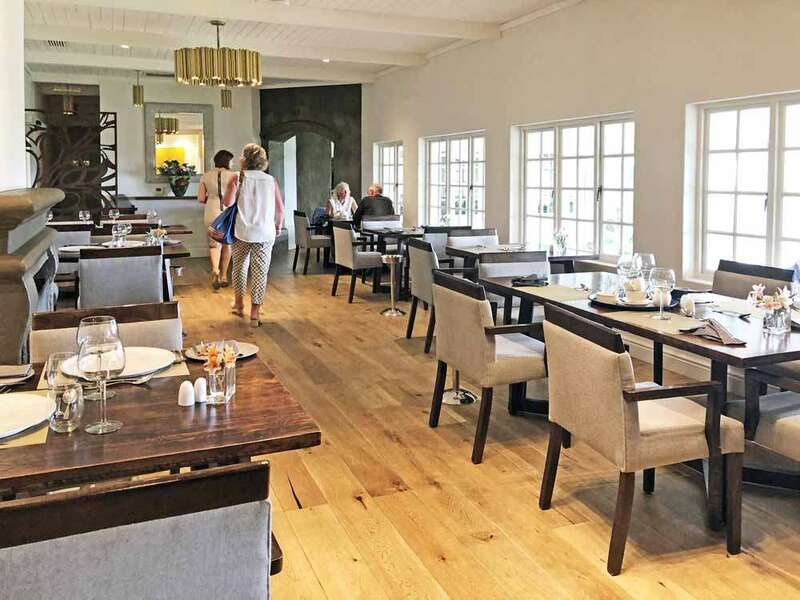 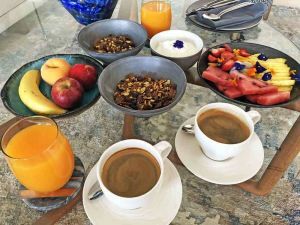 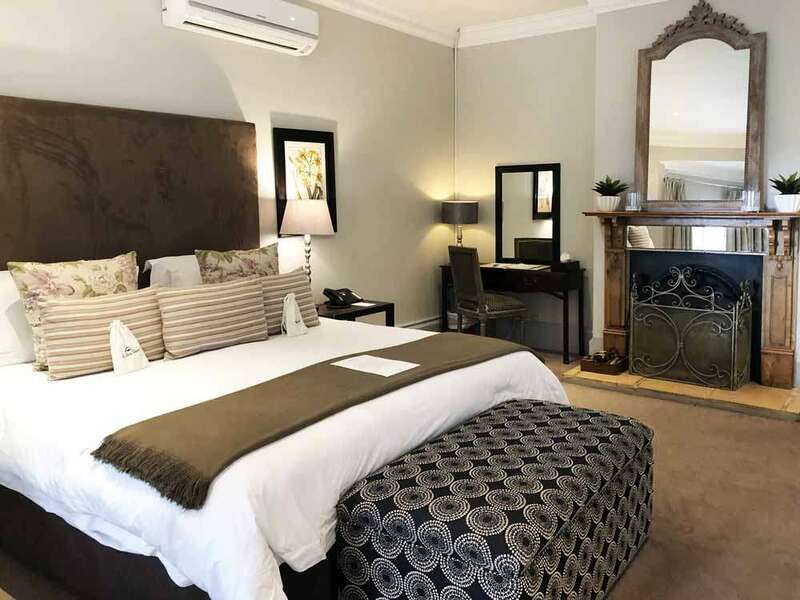 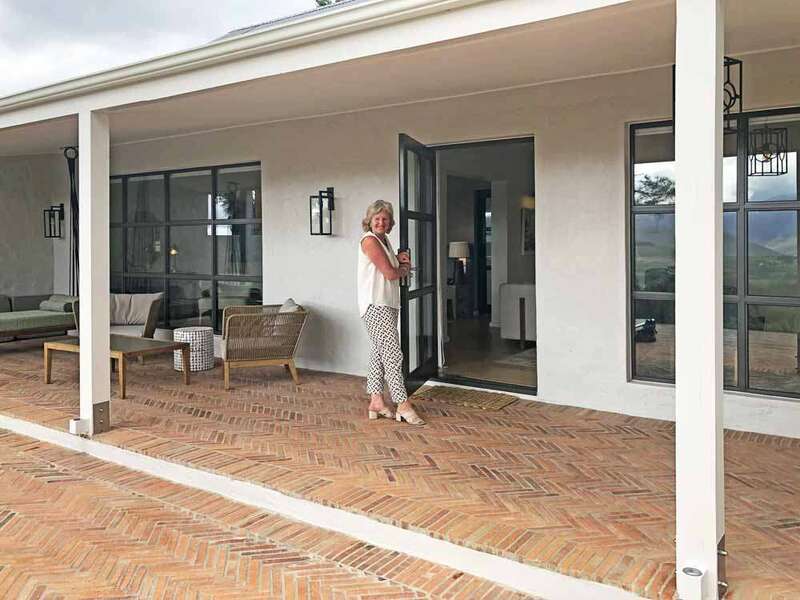 In our opinion, every trip to Cape Town should include a visit to Franschhoek, and every visit to Franschhoek should enjoy a stay with La Petite Ferme. 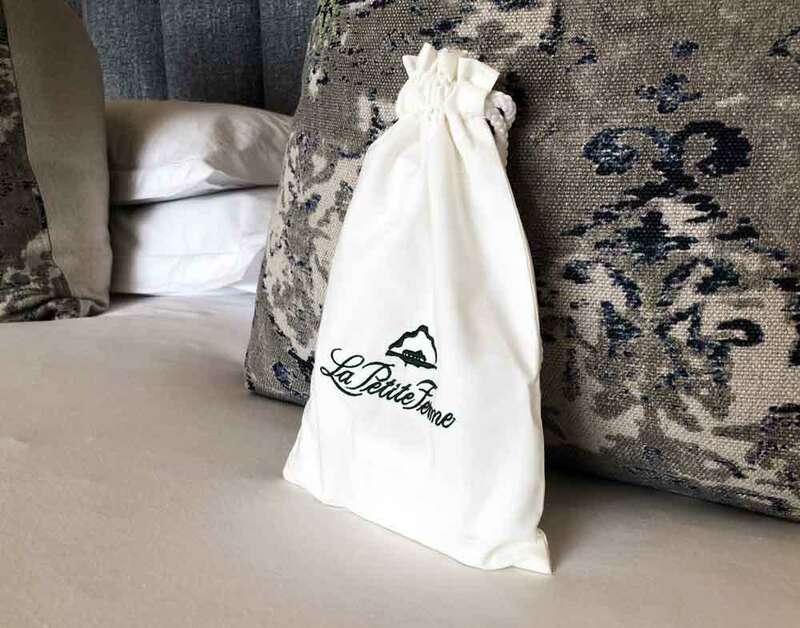 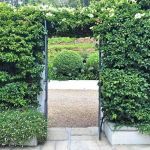 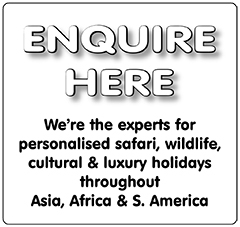 If you’d simply like more information about La Petite Ferme then click here but why not ask us to arrange your own tailor-made travel – to immerse yourself in the wonders of history, culture, cuisine and safari throughout South Africa?